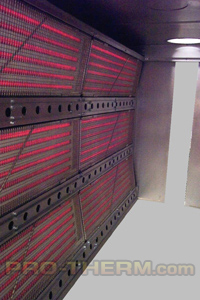 PROTHERM, LLC offers energy efficient, clean electric infrared tunnel ovens for use with Tow line/Trolley conveyors. Tunnel ovens are place over an in floor tow line/trolley conveyor typically used to process large products such as automobiles or large furniture. Common heating processes for this style of oven are drying, preheating/boosting, gelling, and curing. We take a common sense approach to the designs and keep it simple for shipping, installation, maintenance, and operation. Most ovens are constructed in prebuilt sections that simply bolt together making a completed tunnel chamber. Heaters can be mounted to adjustable supports for easy heater positioning. This allows you to direct the infrared energy to the part where it is needed, saving you energy dollars. Heaters can also be supplied to be mounted inside an existing tunnel. 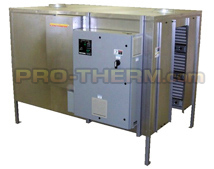 A variety of PROTHERM, LLC electric IR heaters can be used, each with their own heating advantages and unique characteristics All heaters are completely manufactured at Protherm, LLC, assuring you the highest quality, proper application, and support for the life of the oven. Protherm, LLC electric IR heaters are proven to be the highest efficiency and environmentally friendly to save you energy and eliminate hazard and emission issues. Our sales engineers will gladly assist you with specifying a custom prebuilt solution for your application. Contact Protherm, LLC today.